IPF Idiopathic Pulmonary Fibrosis | damn! – I was just getting the hang of being happy! damn! – I was just getting the hang of being happy! Is this a ray of hope? Here in the UK in the year I was told I have IPF (Idiopathic Pulmonary Fibrosis) 5,000 others received the same news. Somewhere between 3 and 4,000 have already died. They didn’t last long enough for a cure which will probably come from genomic developments – so said my consultant. An intriguing article that cuts through the fluff and talks about the realities of finding a cure for IPF. Both Esbriet and Nindetab are mentioned. In part it says: “Via further experiments, Elias’ team found IPF is, in part, caused by fibrotic healing run amuck, trying to keep up with IPF’s ceaseless lung injury. Why is it ceaseless? “The injury process is still enigmatic.” But it is real. 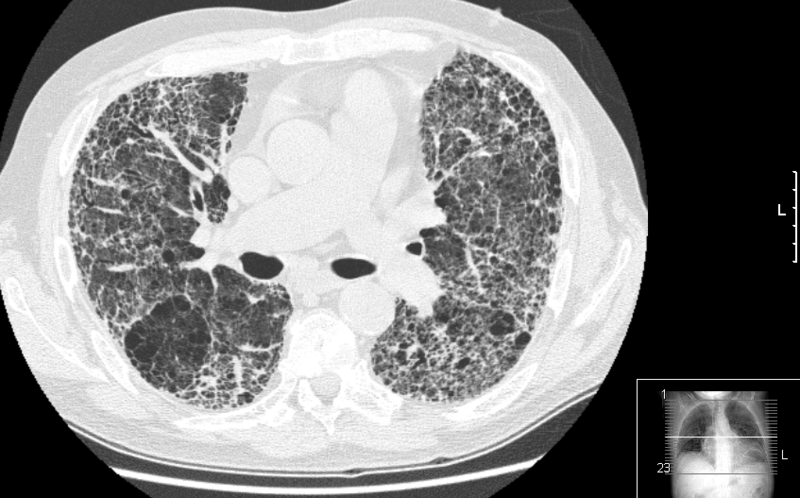 Doctors find, in autopsy, IPF patients’ lungs possess old scarring over old injuries—and fresh scarring over new ones. Categories: Uncategorized | Tags: idiopathic pulmonary fibrosis, IPF, pulmonary fibrosis | Permalink. IPF – Idiopathic Pulmonary Fibrosis – What’s it like if you’ve got it? There is some hope – My ‘Roger’s IPF story’ and approach to healing is at the foot of this evolving research page. Life is still sweet: I don’t feel sorry for myself. My suffering is minimal compared to several dear friends who are seriously ill or who have died in the recent past. I’m ‘winning’ in the sense that more than half of those diagnosed in the same year as myself are now dead. I have the support of Marion, my wife, I have faith, I have an education, & for however long I might have left I have a purpose – celebrating & exploring inter-spirituality. Life is still sweet – every breath, every day. However I also try to rehearse death with every breath and leave the decision to my Maker. ANYONE CAN GET PF – but adults between ages 30-80 are at higher risk . CURE: None – 50% of those diagnosed die within 36 months. PF is relentless, progressive & terminal. WHAT HAPPENS? Patients gradually lose the ability to breathe as their lungs fill with scar tissue. PF IS INCREASING Since 1999 the number of patients with PF has increased by 156%. MISDIAGNOSIS More than 50% of cases are misdiagnosed for a year or more. 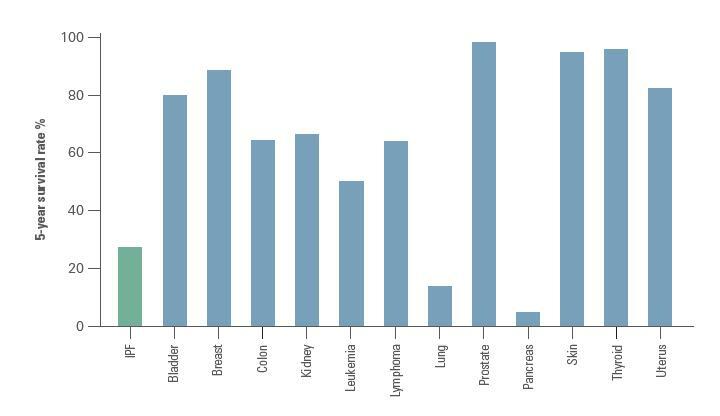 PF PATIENTS ARE NEGLECTED compared to cancer patients. One example – the UK government invested only £600,000 in PF research last year – leukaemia research alone received over £32m. PF receives nothing like the same level of prioritisation as cancers of comparable mortality, eg leukaemia – yet PF – kills more people each year than this one form of cancer alone. UK GENERAL HELP: currently it is difficult to get comparable, appropriate help from most agencies. IPF is a rare disease & many doctors never come across a single case. Ask your MP to help. There are many such stories, many on YouTube. Mine is at the foot of this article. Colin was diagnosed with idiopathic pulmonary fibrosis, IPF, after he became breathless on a walking holiday in Cornwall. Colin was sent for tests and scans and eventually saw a consultant who diagnosed him with IPF. IPF is a build-up of scar tissue that makes lungs thick and hard, making breathing difficult. IPF is incurable and will progressively get worse. About half of people with IPF only live for three years after their diagnosis. In this film, Colin talks about how he is living with IPF and how he has been supported by the British Lung Foundation. NOTES/EXTRACTS TO HELP ME ASK QUESTIONS – NB I’m still not sure if IPF is an autoimmune disease or whether autoimmune diseases are frequently associated with it. Approximately 10-15% of those with an “idiopathic” form of PF have another family member afflicted by the disease. This is called familial pulmonary fibrosis (FPF) or familial interstitial pneumonia (FIP). A number of genes and genetic variants have been identified that are associated with the development pulmonary fibrosis, but frequently genetic tests are not performed when PF is diagnosed, as we are only just beginning to understand the significance of these genetic abnormalities. It is important to discuss the potential risks and benefits of genetic testing with a qualified genetic counselor and your medical provider. To speak with a Certified Genetic Counselor free of charge, contact Janet Talbert, MS, CGC at 800.423.8891, extension 1097. ‘Let food be thy medicine…’ is my general approach but if necessary I use modern drugs. as well as complementary approaches. With IPF particularly you have to manage your life, treatments & death. I have, as all sufferers do, the ‘psychological load’, including the frustration & depression of not knowing if I have 4 weeks or 4 years. The only other guy locally I knew with IPF died last year. He was fitter, slimmer, younger than me – five sets of table tennis he said then suddenly he went from ‘normal’ health to death in 4 weeks. Ironically as yet the oxygenation and pulse are steady and normal 96% & 65 – weird but long may that continue. It must have something to do with my ‘regime’ ? NB Nothing is straightforward with IPF – no cause and effect is simple. 5,000 were diagnosed in the same year as me – more than 3,000 of them are now dead. I was mis-diagnosed – probably for years. My IPF was discovered ‘accidentally’ because I went for a heart scan. I had a devastating ‘flare-up’ that lasted for 3 months over Christmas – which was a step further down the un-primrose path – in that exhaustion sets in earlier and I need to rest and sleep even more. The previous Christmas I had 3 months of a devastating virus/bacterial infection….. Had to sleep on my knees lying forward on sofa or bed. Stay away from people with colds, flu etc.! SLEEP APNEA: Thank God my heart consultant referred me to a sleep clinic. I was successfully treated in that they supplied me with ‘the gold standard’ RESMED 9 machine which I have to breath from each night. STRATEGY 1 If there is anything specific that might help specifically with the IPF do that. STRATEGY 2 If there is anything that might boost your general health do that. I take occasional take breaks from my two regimes to give my liver & kidneys a rest and to re-…..
STRATEGY 1 If there is anything specific that might help specifically with the IPF do that. 1 The first two specific things I did was to start taking two enzymes Nattokinase and Serrapeptase. Enzyme therapy isn’t accepted but quite a few use it. The second thing in the first year after diagnosis was to consultant a qualified medical herbalist whose primary approach was to reduce inflammation. After a while she added one or two herbs to the medicine she made up for me that are specific for lungs. I also did some sessions with an acupuncturist. In the shock of those first days, weeks and months after diagnosis you will eat horse-dung sandwiches if you think they would have a slight chance of helping. The sheer cruelty of the way the NHS treats someone at this point is dreadful, but that is another subject. The sheer cruelty of aspects of the govt agencies is dreadful – partly because no one helps you – also another story. Our MP Norman Baker has been brilliant. What might cause the disease to accelerate? a. “We don’t have an answer to that.” ETC. I took on the superhuman task of trying to create, as far as possible, my own therapy. The main problem is that the resources of one desperately ill person are limited. In flare ups or times of viral/bacterial infection I can barely get from bedroom to lounge. I had two pieces of bad luck – a friend who could have helped with understanding research papers died after 7 years of hell with lung cancer – he was one of the world’s most eminent professors in the field of lung disease! A family one of whose members died said they would help me – and then changed their minds. Cruel. I research several hours every week. STRATEGY 2 If there is anything that might boost your general health do that. PLEASE ask UK govt to stop the neglect. – Some IPF patients say; ‘I wish I had cancer instead’. INTRO: Miraculous work is done by the NHS every day but not if you have IPF. IPF – idiopathic pulmonary fibrosis – is an incurable lung disease that results in progressive lack of oxygen, which in turn causes general organ failure & death. IPF is listed as an autoimmune disease. It isn’t contagious. There is no cure. With IPF according to my consultant, you die, in the UK, on average 33 months from diagnosis. Some die earlier than that, some die less, quickly. 33 months is the median. 15,000 have the disease in the UK. 5,000 die every year. More than 5,000 cases replace those who die. THE UK GOVT ISN’T TAKING EFFECTIVE ACTION. Compare the 5,000 deaths to road deaths which have fallen from around 5,500 per year in mid 1980s to 1,754 in 2012. IPF deaths just go up steadily up. Whatever the actions were for road safety we IPF patients want a similar level of action for IPF sufferers. NO SUPPORT – MONETARY SUPPORT FOR CANCER PATIENTS – frequently a great deal – see HERE – MONETARY SUPPORT FOR IPF PATIENTS – little or next to nothing. IPF Idiopathic Pulmonary fibrosis kills 5,000 people each year – that’s more than leukaemia. UK research spend on IPF is only £600 thousand. On leukaemia alone in UK = £ 32 million. £521 million on cancer as a whole in 2013 – (Cancer Research UK, 2013). With IPF increasing by more than 5% a year it could be just a few years before you or someone in your family will have it! Unlike for cancer, there are an inherent lack of integrated services, no Strategic Clinical Network for respiratory diseases, and currently no approved quality standards. An “urgent” referral for an IPF patient can take months – for cancer, the vast majority are seen within two weeks. As a result, IPF patients often endure delayed diagnosis, inconsistent care, limited or inadequate information concerning their disease, limited treatment options & a lack of end-of-life palliative care. Please ask your MP to get the Govt moving to help save or improve the lives of 15,000 UK citizens. I recently had the the news that my life-span will be cut short. I am committed to enjoying every moment of every day, and to being the longest surviving IPF patient. Looking Mr D squarely in the face is vital but I’m not going to play chess with him, as in a certain Ingmar Bergman film, nor will I Iet him spoil any flash of beauty that comes my way. I acknowledge that the minute, hour and day is set – so be it. (As it is for everyone – but we manage to ignore the fact most of the time.) But today is the first day of a shorter life as much as it is the first day of the rest of the life of anyone with a century to live – so let me breathe in all it’s truth, beauty & goodness! ‘Abdu’l-Bahá answered: “How does one look forward to the goal of any journey? With hope and with expectation. It is even so with the end of this earthly journey. In the next world, man will find himself freed from many of the disabilities under which he now suffers. Those who have passed on through death, have a sphere of their own. It is not removed from ours; their work, the work of the Kingdom, is ours; but it is sanctified from what we call ‘time and place.’ Time with us is measured by the sun. When there is no more sunrise, and no more sunset, that kind of time does not exist for man. Those who have ascended have different attributes from those who are still on earth, yet there is no real separation. Someone present asked how it was that in prayer and meditation the heart often turns with instinctive appeal to some friend who has passed into the next life. One theme that cuts across death and death of the ego is reality as in the is-ness of things – don’t quarrel with a rose-tree because it can’t sing! Dr Death came calling – but I’m still happy! 19th Nov 2014 – have had heart palpitations etc since Christmas. Thank God I asked to see a heart Consultant who sent me to a sleep apnea clinic. Now use a CPAP machine and a mask which pumps compressed air into my lungs to give me periods of deeper sleep. 27th Oct UPDATE – Saw Consultant last Monday who said I’m in ‘slow decline’, but not much change. Am trying to make it slower! UPDATE Oct 7th 2013 – In a few days I will visit the Consultant for the 4th time. Now is about the time I should be dying if I am completely average – the average is 2 to 3 years from diagnosis. I have developed a complex regime which I still haven’t got around to describing properly. At present I am doing very little of it as a holiday – and feel better than I have for a very long time. One of the frustrating things about IPF is you know nothing for certain – and no one else knows anything of any importance either. Something seems to have worked for me but out of about 30 things I was doing I have no idea what it was. Upon diagnosis when the Consultant tells you, “No cure, no hope, no effective amelioration,” (and you get the feeling that you are being told to go away and die quietly and please don’t make a mess) – when you hear this you quickly decide to do almost anything. I think one or more things are working – but it could be just a temporary stabilization. If I knew what if anything is helping I would do more, or take more of it! I had an acupuncture treatment about 6 weeks ago and felt great afterwards – although at about the same time we switched to coconut oil instead of butter/margarine/sunflower oil – so I will go back to the acupuncturist and I will keep on with the coconut oil. Coconut is supposed to be a wonder food – see HERE I can hear the allopathic physicians and other sceptics muttering into their double cheese-burgers. Just in case you think I don’t mean what I say I have tried healing from a horse whisperer, endless vitamins including a supplement made from the stomach lining of silk worms, various kinds of jungle juice. I stand barefoot on the grass of Seaford Head most days, having jogged up the first section of the Head. If you go into anaphylactic shock when you accidentally eat peanuts you have a clear understanding of cause and effect. The knowledge base in terms of cause and effect in IPF is not much above zero. They only agreed on the name for it in the year 2000. If I hadn’t seen the HR scan of my lungs I wouldn’t now believe I have an incurable disease. The one clearly identified symptom a cough seems to have gone, so has the phlegm, so have the strange chest pains. If you have been keeping me in your thoughts, or have been praying for me or have been visiting your local witch doctor on my behalf – thanks and keep doing it! I will complete this update after I have seen the consultant. If this is your first visit here you might want to read what is below. IMAGE SOURCE – not my lungs but mine look very similar. WELCOME to this blog which is my journey having been diagnosed with IPF Idiopathic Pulmonary Fibrosis earlier this year – 2012. The information was casually dropped in my ear by my GP over the phone – followed by NOTHING – not even an offer of a 10min chat! Confirmation came from the consultant on 6th June and again on the 17th October. The blog is about a) the information I’m collecting and b) reflections, including some (dark) humour, on having my life expectancy so drastically reduced. I hope it is of some help to others. The consultant thinks that my Pulmonary Fibrosis was caused from asbestos. Beware asbestos – we lived next to an asbestos-roofed barn for 14 years. THE BAD NEWS as Prognosis – Half of IPF sufferers in the UK die within three years of diagnosis. I’m dedicated to extending that as far as possible – wish me luck! In the UK IPF kills about 5,000 people every year (more than leukemia or ovarian cancer). A well known case of IPF was Evel Knievel, a famous stuntman who died of IPF. Re the cause – next to nothing! Re-amelioration – next to nothing except some potentially dangerous drugs – one of the latest they tried was Thalidomide! They know some bits but can’t fit it together. PART A – developing the highest possible level of general health – vitality & balance etc. NB I’m telling you for information only what I’m doing. You must make up your own mind – in consultation with your own health professionals. If anyone can crack IPF they might get a Nobel Prize! I am searching everywhere. I read full-blown scientific papers but I’m not sniffy about getting important ideas from other sources – even the Daily Mail! My personal programme in a little more detail is concentrating on the first of two parts, getting my general health and fitness to as a high a level as I can. I have already made a lot of progress. The second part, that which is aimed specifically at IPF, I will start soon. Much attention to diet & food supplements – particularly stuff good for getting a healthy stomach, gut & digestion. Gym workout/and or ‘power walking’ up to 5 times a week, with emphasis on the aerobic. Medical herbalism programme – which as I understand is aimed at eliminating inflammation and getting a healthy stomach, gut & digestion. Meditation, prayer, humming, EFT, Paul McKenna tapes – anything to keep me positive – not all of them every day! I will include more detail soon. Categories: pulmonary fibrosis | Tags: idiopathic pulmonary fibrosis, IPF, pulmonary fibrosis | Permalink.